This article explains how to use Scanner by walking through a simple application: converting a video to grayscale. After grayscale_conversion.py exits, you should have a grayscale version of sample-clip.mp4 named sample-grayscale.mp4 in the current directory. Let’s see how that happened by looking inside main.py. NamedVideoStream is a stream that stores data in Scanner’s internal database format (see Stored Streams for more detail). In this case, we stored the data under the name sample-clip for the video file sample-clip.mp4. At this point, we have defined a graph that describes the computation to run, but we haven’t yet told Scanner to execute the graph. This call will block until Scanner has finished processing the job. You should see a progress bar while Scanner is executing the computation graph. The PerfParams are parameters used to tune the performance of graph execution, e.g. the number of video frames that should be in memory at any one time. By default, the estimate() guesses an appropriate value of all parameters for your graph. 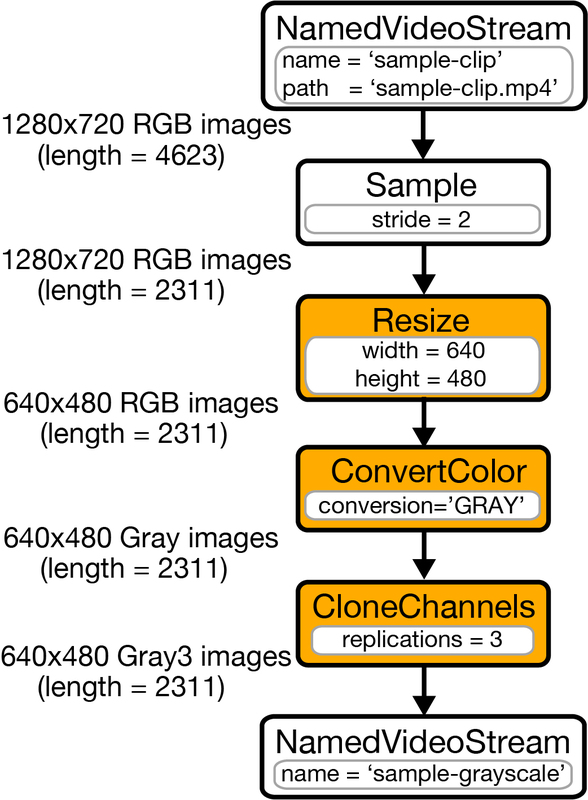 After this call returns, an mp4 video should be saved to the current working directory called sample-grayscale.mp4 that consists of the grayscale frames that we generated. That’s the complete Scanner application! Tutorials: introduces each of Scanner’s features with code examples. Computation Graphs: describes how computation graphs are constructed and configured. Operations: describes the capabilities of Scanner’s ops and how they work inside computation graphs. Stored Streams: describes the stored stream interface. Performance Profiling: describes how to profile Scanner applications and improve their performance. Then visit port 8888 on your server/localhost, click through to examples/Walkthrough.ipynb, and follow the directions in the notebook.